Zamberlan has a rich history and enjoys excellent reputation when it comes to performance footwear and was eager to road test their latest speed hiking shoes. As someone who prefers the versatility and comfort of a lightweight hiking shoe the Zamberlan 132 Airound GTX RR appeared to tick the right boxes. The shoes mark a significant advancement in footwear design as they are the first to include 360-degree breathability around the entire foot, a definite blessing when tackling the hot and humid summer conditions in Japan. While the shoes edge on the pricer side of the speed hiking sphere they have shown themselves to be capable of handling a variety of terrain. Zamberlan also offers a mid-cut version of this shoe for those looking for additional ankle support. One point to note is while most Zamberlan footwear is fashioned in Italy these shoes are made in Vietnam. Out of the box the 132 Airound GTX RR felt terrific and as expected didn’t require any break in time before hitting the trail. Size wise the shoes run about right for a US 9 and feel comfortable wearing standard thickness hiking socks. Coming in at 780 grams a pair they are only marginally heavier than my previous Mammut Redburn GTX’s. The inclusion of an elastic gusset provides decent foot wrapping in the front part of the toe and airflow is maintained using a mesh upper. The other nice aspect is the lack of stitching on the upper which is heat sealed delivering a minimalist, streamlined appearance. With any speed hiking shoe stability is paramount and being equipped with a Vibram outsole and thermoplastic polyurethane (TPU) stabilizers under the arch ensures good stability on technical trails. The shoes have a reasonable aggressive stance which differentiates them from most trail running shoes and thus are more suited to long haul overnight backpacking. The propriety Zamberlan Vibram speed hiking outsole with V-shaped lugs allow you to confidently scramble up rocky ridges and maintain good traction in the wet. The only issue noted was some underfoot slippage walking downhill along wet bitumen roads. The toe protection whilst not as extensive as the Redburn GTX’s still ensures the front foot is adequately shielded from rocks and other trail material. In the wet the shoes have a high degree of waterproofness with PU (polyurethane) sealing in addition to GORE-TEX SURROUND making for a dry, comfortable foot environment. Over the past month the shoes have endured some long, hard trails as well as a couple of overnight hikes. The shoes have held up remarkably well and show little in the way of battle scaring. My previous experience with Zamberlan boots are they wear well for the life of the shoe better than most brands and hopefully these will be the same. For those of us who like to push our footwear hard and prefer a lightweight hiking shoe over a traditional hiking boot the 132 Airound GTX RR’s make an appealing choice. 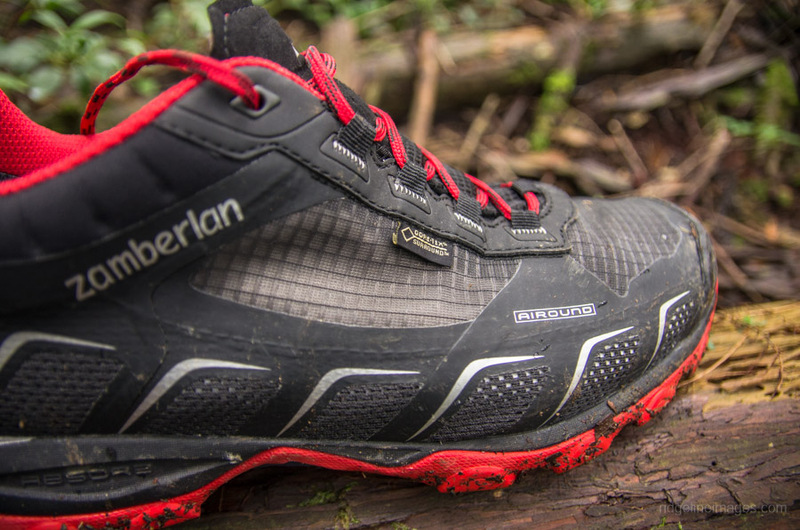 The Zamberlan 132 Airound GTX RR are an excellent lightweight and supportive speed hiking shoe ideal for both dry and wet climates.